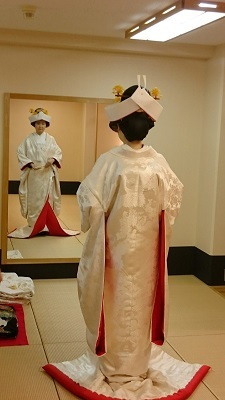 The bride-to-be wearing a “Shiromuku (=White Wedding Gown)” and a wig with “Tsunokakushi (=Head Dress)”. This “Tsunokakushi” is with a red line in white background which is coordinated with the color of the lining of “Uchikake (=Wedding Gown)”. “Iro-Uchikake” with classical pattern and a wig with “Tsunokakushi”. “Iro-Uchikake” in modern pink coordinated with the braided western hair style. 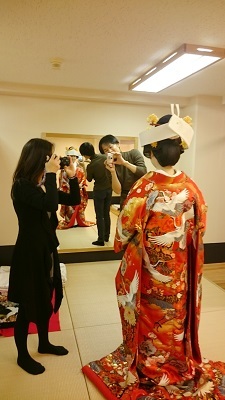 Today at LST Wedding Kyoto, “Fitting event for kimonos with wigs and western hair styles” was held. It is one of our popular events at which you can try “Uchikake (Japanese Wedding Gown)” with wigs and also western hair style. The lady of the photo is going to get married next July. She came to the event with her future husband and her mother. The bride’s mother and the groom are both very good at taking photos. It was like a special photo session held for the bride! Her standing posture in kimono was so beautiful and she also looked great wearing the wig. We are looking forward to see her on their real wedding day. There will be another fitting event on Sunday, 24th January 2016! Please come and join the event.